This guide will talk about the solution for partition resizing on Windows Server 2012 when FAT32 partition runs on low disk space. Download IM-Magic Partition Resizer Server to increase the size of FAT32 partition when has no enough free space in Windows 2012. Partition on Windows Server PC usually has NTFS or FAT32 file system. If you want to increase the size of FAT32 partition, the best way is to rely on third-party partition software. IM-Magic Partition Resizer Server is professional partition software for Windows Server users, with which you can resize FAT32 partition without touching the operating system or original data stored on the disk. This partition software can work on Windows Server 2012 and other Windows Server like Windows 2003, 2008, etc. Download, install and run IM-Magic Partition Resize Server. Right click a partition that has much free space and choose "Resize/Move" option. 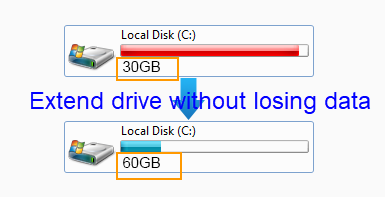 Shrink the selected partition so that you can produce some unallocated space. You need to move the unallocated space close to the FAT32 partition that runs on low disk space. 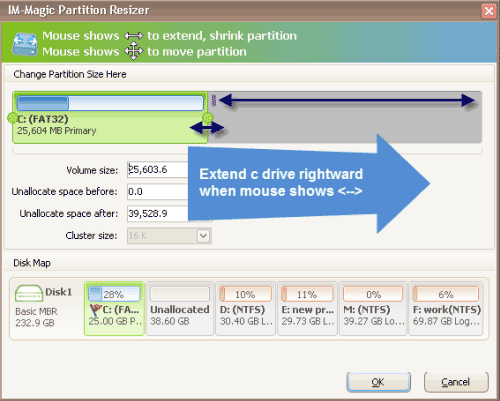 Then, right click the FAT32 partition and choose "Resize/Move" option. "There are two partitions on my PC which runs under Windows Server 2012 operating system. The system partition which has FAT32 file system has about 50GB capacity only with 1GB free space left. The other partition has NTFS file system and it still has much free space. So I want to move some free space from the NTFS partition to FAT32 system partition. I tired to run Diskpart command, but it cannot help me get the partition extended. Is there any other way to resize FAT32 partition on Windows Server 2012?" "Is there any partition software with which I can increase size of system partition without rebooting the computer? Well, my computer runs Windows 2012 system, and the system partition has FAT32 file system. Recently, the system partition is running on low disk space and I have tried some partition software to extend the partition space, but the result is not so good. I want to look for a partition tool which can help resize FAT32 partition without rebooting computer or reinstall system. Can you give me any clue?" IM-Magic Partition Resizer Server is specially designed for Windows Server users to help resize hard disk when any of partition is running out of disk space. This partition software supports both NTFS and FAT32 partition resizing. By using this partition software, you can move free space from one partition to another. Therefore, you can simply move free space from other partition to extend the partition which runs on low disk space. No matter you want to extend a system partition or data partition, the partition software can effectively resize the disk partition with original data untouched. A system partition under Windows Server 2012 operating system can be NTFS file system or FAT32 file system. When a system partition is running on low disk space, it might be more difficult to perform partition resizing because system partition often contains important data which has influence on the operating system. Traditionally, you may need to reinstall system, reformat the partition and repartition the hard disk in order to fix the low disk space problem on a system partition. Now, you can easily increase the size of system partition by relying on the partition software. With the partition software, you can increase the size of partition without formatting the disk or reinstall system. As professional partition software, IM-Magic Partition Resizer Server can extend partition, shrink partition and move partition, etc. As a matter of fact, before you can expand a partition, unallocated space is always needed. Then, how can you produce unallocated space? You can use the partition software to shrink the partition that has lots of free space so as to squeeze some unallocated space. You should remember that you can only squeeze any partition on the same hard disk. When the unallocated space is created, you still need to move it close to the partition that you want to extend. Otherwise, you cannot add the unallocated space to the partition that runs on low disk space.